"We hear that young Yitzchok went right wing already as a bochur"
Dr. Tovah Lichtenstein has a BA from Harvard University and an MSW from Columbia University. She earned a PhD from Bar-Ilan University. Dr. Tovah Lichtenstein has lectured in Israel and the United States on a wide range of topics, both in child welfare and Torah learning. 1)His Shver was Rav Chaim ben Rav Reuven Grozovsky ZTL who lived in Boro Park and had a shtiebel 2)RYL learnt many years by Rav Dovid Soloveichik Shlita. "His Shver was Rav Chaim ben Rav Reuven Grozovsky ZTL who lived in Boro Park and had a shtiebel"
He had a Kayllel, he wasn't a Chasidishe Rebbe with a shtiebel. The Kayllel davened sometimes too, yes. After he was niftar it was sold to a R. Glick. At first it continued as a Yeshivishe minyan, but then he converted it to a Chasidishe shtiebel. Contrary to the writer's thoughts, the bais medrash still has 150 people learning there daily. And there aren't harries there; they guys are good geshmak guys. The bochurim are well sought after when it comes to shidduchim. As a shadchan, parents often tell me that their daughters want a Torah Vodaas boy. I have been there to check out some boys and the bais medrash has a very nice "Kol Torah." A Brisker descendant of RYBS serving as Rosh Yeshiva of a Chassidus-rooted yeshiva with too many Harrys, that was saved by the Lubavitch Rebbe. post: "A Rav Pam, I suppose. Not sure if that's what they got in RYL." 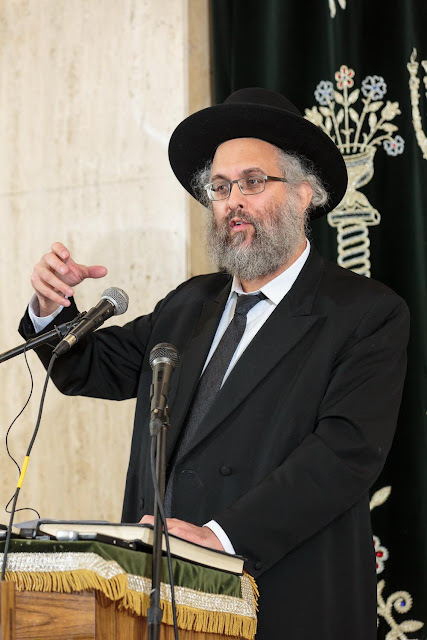 Served as chairman of the Rabbinical Committee of the umbrella organization of Jewish education in the United States "Torah and Masoret" and as chairman of the Council of Torah Sages of "Agudath Israel" in the United States. He was also instrumental in publishing his Zayda's Torah (R' Moshe Soloveitchik), much of which was from his father R' Chaim, and lots of which had already been published by his Uncle, R' Velvel. Extremely unlikely that this is true. Rav Rivkin was appointed in 1928. The Lubavitcher Rebbe who didn't even visit America until 1929 would have had very little influence on any decision being made by a Yeshiva there headed by non-Lubavitchers. Whatever happened with Rav Savitsky? Or is this a replacement for Rav Belsky? Rabbi "Nesanel Quinn", director of the renowned "Yeshivah Torah Vodaas" of Brooklyn. From what I understand, and from what I have heard from R' Gottdiener, there were 3 Roshei Yeshiva which included Hagaon Rav Belsky zt"l. After his petirah, the yeshiva searched for someone to replace him as the third Rosh Yeshiva. Rav Savitzky is still the elder Rosh Yeshiva and gives the highest shiur. Rav Reisman is also very popular in the yeshiva and well known world-wide. He is also a Rosh Yeshiva. They needed someone like Rav Belsky who would live in the area and Daven there daily and on Shabbos and R Lichtenstein will be moving to Kensington shortly. Although a tremendous Talmid Chochum, no one can replace the greatness of Rabbi Belsky. YTV has not had an ivy League talmid chochem wt the helmet since Rav Pam ztl. Of course Rab Belsky ztl was a genius with a memory most anybody would envy and bekiyus in halacha seforim that few could could match. But halacha is not what Yeshivos teach. Has anybody ever heard a shiur in lumdis from him worth repeating? His lack of mesora, (Who was his rebbe muvhak? Reb Yaakov? Maybe? That's what the story books say. But will the TVers of old who remember tell you that they were really close?) his abrasive personality, his lack of an influence anywhere outside of his close circle of Talmidim (While he was alive, was he taken seriously anywhere in the Olam Hatora?). Therefore the Yeshiva dwindled seriously under his leadership. Rav Savitzky is a nice man. I'm not sure if anybody outside of TV has ever heard anything from him and can you honestly say that most in the Yeshiva have? Rav Reisman is a super talented speaker and beloved by all. They gave him the RY position hoping it would attract more talmidim, but again, hes just not at that top tier . WAIT DOES THIS MEAN WITH A NEW PROPERLY BRISK ROSH YESHIVA TORAH VODDATH WILL JOIN CHAIM BERLIN AND SATMAR IN ALL THE ANTI GIYUS PROTESTS? Firstly, no, Torah Vodaath will not join the protests. Secondly, you disparaged Rabbi Belsky. I personally learned in the yeshiva, and he was the rock of the bais medrash. He was totally dedicated to the yeshiva and had many many Talmidim. Although the last 10 years he only gave the semicha shiur, previously he had given the chullin shiur, as well as a gemorah shiur. He was well sought out by the oilam hatorah here in the United States, and all heavy shailos went to him. Everyone always would ask - What is Rav Belsky's opinion about the copepods in the water? Or his shittah abt bugs in the water? Or the eiruv in Boro park? Any big psak came to his address. 506 East 7th street had people all night coming to meet with the Rosh Hayeshiva. Yes, R belsky was extremely close with R Yaakov Kaminetzky. Ask R Shmuel, he will tell you the same. And yes, Rabbi Reisman is the Rosh yeshiva as well, but since he is the Rav of Agudas Yisroel of Madison, he can't be in the yeshiva 24/7. That is what is needed. By the way, my friends who are close to R Reisman say that all along he didn't want to assume to responsibilities that R Belsky had of carrying the yeshiva. He is a huge masmid and really just wants to learn. Those who know him well tell me how little he sleeps, as he balances his klal role of helping some people, counseling others, involving himself in kashrus or even Quicken loans, while at the same time always grabbing every moment to learn. It is well known that Rav Reisman stays up each Thursday night to learn the entire evening. He doesn't want to speak at every parlor meeting. He doesn't want to run to every chasunah or levaya to represent Torah Vodaath. I guess time will tell if R Lichtenstein can. May the yeshiva be matzliach in their avodas hakodesh. U: "BRISK ROSH YESHIVA TORAH VODDATH WILL JOIN.."
UN: "THE ANTI GIYUS PROTESTS?" "43 percent are reportedly concerned the State of Israel is in danger of being destroyed, according to a poll conducted by Tel-Hai Academic College." שלושה ימים לבכי "ושבעה להספד" ושלושים לגיהוץ.. מכאן ואילך.. Après moi, le déluge ? "no one can replace the greatness of Rabbi Belsky".